Are you looking for an internship this year? Become an AAUW-PA Emerging Leader Intern. Work toward the mission and build your resume simultaneously. Download the attached description of the internship opportunities and the application form. Application deadline is October 1. Are you interested in other leadership opportunities? Consider applying to become one of the first AAUW-PA Student Advisory Council (SAC) members. Want more info or want to apply? Download the SAC description and application form. Application deadline is October 15. Sara Abdollahi, a Ph.D. candidate in engineering and public policy at Carnegie Mellon University. Sara won the Ward-Roney Grant. CONGRATULATIONS also to Khloud Hassan-Assran, a junior at Moravian College, who accepted a national grant to attend NCCWSL. CONGRATULATIONS to Northampton Community College on winning one of this year’s eleven AAUW Campus Action Project grants to implement recommendations from the 2013 AAUW research report Women in Community College: Access to Success! The team will support student parents by launching a series of four workshops that will provide them with resources to help them graduate. The workshops will be delivered by community experts and will focus on the following topics: choosing and affording child care; child development milestones; balancing school, life, and work; and self-care. By hosting these workshops for student parents, Northampton Community College will create a supportive relationship between the college and student parents. AAUW offers great opportunities for students. Student affiliations are valuable. Find out more about the program and how to affiliate at the state and local levels, too. Affiliate as a student at the national level only. It’s free if your college or university is an AAUW member. Find out whether your college or university is a member. Yes, my college/university is a partner member of AAUW. I want to join AAUW for free as an e-Student Affiliate. My college/university is NOT a partner member of AAUW. I want to join AAUW as a Student Affiliate for $17. 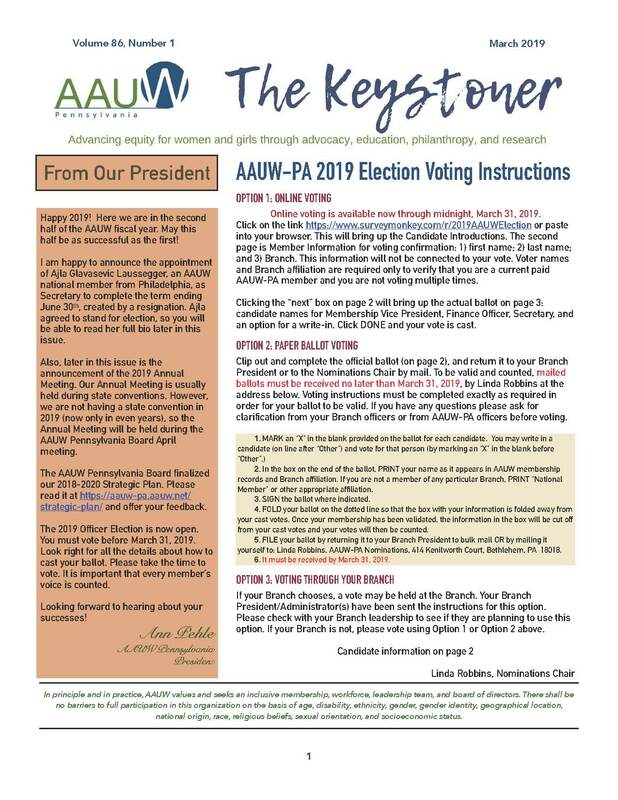 Join AAUW-PA, too! Contact the Membership Vice President and pay NO PA State dues while you are a student! Join in the conversation with other Pennsylvania Students on the AAUW PA Student Blog. Branches, find out more about how to offer an Emerging-Leader Internship of your own. Students, apply for an Emerging Leader internship at the branch or state level. Get more information about the Emerging-Leader-intern program. To apply for a state internship, download the application form. This program is a nationally sponsored program and provides significant advantages to partners and their students. Campus Action Project (CAP) grants enable student leaders and campus faculty to design and implement effective programs that enhance campus offerings, promote leadership, and improve academic and career outcomes. The 2013–14 Campus Action Project (CAP) grants will focus on the issues raised in the research report Women in Community Colleges: Access to Success and are open to teams from both two-year and four-year institutions. This year’s completed Campus Action Project grant application must be sent no later than 11:59 p.m. EDT October 21, 2013, to leadership@aauw.org. Why do women earn only $0.77 of the male’s $1.00? Part of that answer is that many women do not know how to negotiate salary and benefits during their careers. The $tart $mart program, offered by AAUW, targets college women and helps them understand their positions of strength. Elect Her encourages and trains women to run for offices in student government on their campuses. The National Student Advisory Council is an annual leadership program for 10 college women nationwide to serve as AAUW ambassadors on their campuses. Thank you from Emalee Lally . . .
Emalee talks about her NCCWSL experience, click here to see what she has to say. NCCWSL: Register for the life-changing experience and AAUW-PA can help you get there. Click here for the NCCWSL Grant Application. Kirstin McKenzie, Juniata College class of 2016, won one of AAUW-PA’s NCCWSL grants in 2013. The exciting National Conference for College Women Student Leaders (NCCWSL), held at the University of Maryland at the end of May or beginning of June each year, brings together college women from all over the US to learn about leadership. Wondering whether you should go? Watch this testimonial from Kate Cohen, a Moravian College student who attended NCCWSL in 2012. AAUW-PA now offers FIVE grants to undergraduate women who either reside in Pennsylvania or are enrolled in a PA college or university. Grants cover registration, housing, and most meals. To apply, complete the AAUW-PA NCCWSL Grant Application due by Tuesday, March 10, 2015. Some branches sponsor NCCWSL grants; check with a branch near you. Registered attendees may also apply for national-level scholarships. Provide a grant to a local student. Such efforts could be the start of many successful partnerships, leading perhaps to an Affiliate group, a new C/U partnership, or a branch Emerging Leader Intern. Contact Deb Roney for information on how to do all of this. To support the general operating funds for the conference, contribute online at Give to AAUW. Click on the “Give now” link underneath “Leadership” on the right; that will bring up a secure donation screen through which you can make your donation. Want to work effectively with NCCWSL attendees? In 2013, several students from Pennsylvania universities and colleges or residing in Pennsylvania enjoyed learning skills that will last them a lifetime and agreed to speak at branches. Raise money for a grant to support other students at that college to attend NCCWSL next year. Note that C/U partners–those colleges and universities that are members of AAUW–receive 15% off the registration fees if a group of 4 or more students register as a group. Find out whether your college or university is a member.